Последовательный курс игры на фортепиано. Ритм. 25 этюдов без октав. Соч. 22. Ноты. 2-е изд., стер. Félix Le Couppey (1811–1887) was a French composer, pianist, teacher. For many years Le Couppey taught at the Paris Conservatoire piano, harmony, accompaniment; became the author of a number of manuals on piano playing, a lot of studies and piano pieces. The cycles of studies "The Rhythm" presented in this collection is one of the parts of Le Couppey's basic work entitled "The Progressive Course of Piano Playing". 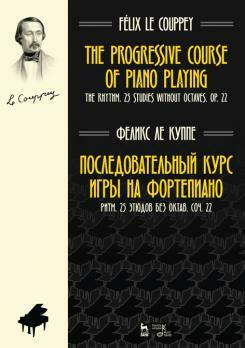 Intended for the youngest pianists, this opus contains the rhythmic studies of the primary and secondary levels.